Do you need to image, measure, and analyze similar features across many samples and materials? 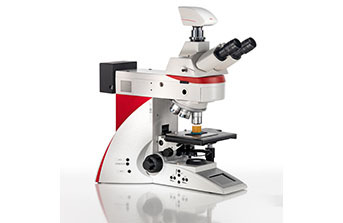 The Leica DM4 M manual routine inspection microscope offers advanced capability and optics in a platform with modern functionality. One-button Intelligent Automation makes your repetitive work easy. Reduce training time, improve your workflow, and get brilliant imaging results every time with the microscope that doesn't forget. 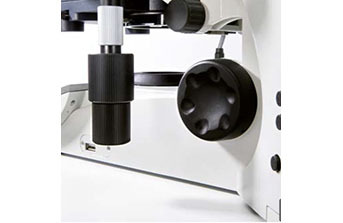 •Save valuable time: With the Illumination Manager and Contrast Manager, the microscope automatically recognizes the selected contrast technique and objective in use, accurately opens and closes the aperture and field diaphragms, and adapts the light intensity. •Share and compare your results – anytime and anywhere! Store and recall your microscope settings and camera parameters with the Leica Microscope Assistant (Leica LAS Store and Recall Module). They are saved and archived with the images, and can be restored at any time. •The Leica Application Suite (LAS) software platform integrates the microscope, software, and camera into one package, focusing on efficiency in every aspect of the interface, functionality, and workflow. 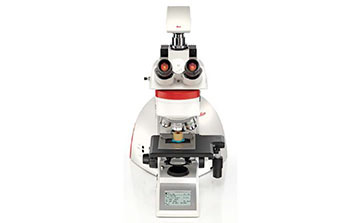 •Work comfortably and quickly with the Leica DM4 M: A clearly arranged display shows all microscope settings at a glance. Six function keys make frequently used functions easily accessible – without looking up from the sample. •LED illumination contributes to reproducible results – whether you work with brightfield (BF), High Dynamic Darkfield (HDF), Differential Interference Contrast (DIC), Fluorescence (FL), or Polarization (POL). •Detect even the finest details with the fully automated differential interference contrast (DIC) and the 1.25 x Panorama objective. 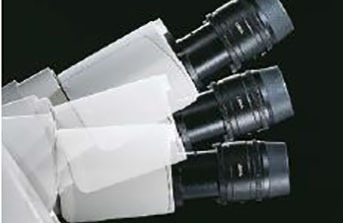 •Coded 6-fold or 7-fold objective nosepiece. •Manual 3-plate stage ergonomically placed.